There has been a lot of news lately that the Philippines is poised to host the next edition of Miss Universe. But the more likely scenario is that the Philippines will host it in 2017 which means the 2016 edition will once again be held in Las Vegas unless a last minute deal has been made. But like any other major pageant these days, convincing a government to host a Big5 pageant is a tough sell. Gone are the days when countries are excited about hosting on the premise that this would encourage tourism and help the local economy. If a pageant foots its own bill just to show off that it’s on an exotic or a prestigious location, it will simply be unsustainable. Last year’s snafu during the coronation did put “Miss Universe” once again in the vocabulary of the common man. It may be a negative publicity, but it is publicity nonetheless. Now the question is, what’s in store for us at Miss Universe 2016? Well, the departure of Oleksandra Nikoyalenko-Ruffin from the Miss Universe Ukraine pageant shows that intricate relationship between the Trump-Ruffin business empires. When Trump bolted out from MUO, the Ruffins followed suit. And while we thought that everything will go downhill for Ukraine, boy we are all wrong! When Alena Spodynyuk was crowned as Miss Universe Ukraine, the perception about her country changed dramatically. 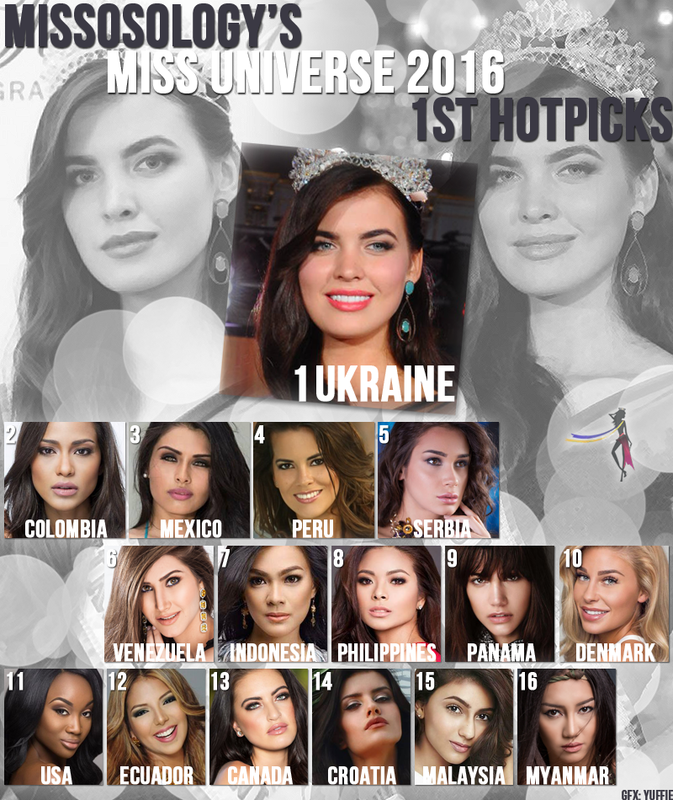 Ukraine is long overdue for a Miss Universe crown, and Alena Spodynyuk leading our first ever Miss Universe hot picks reflects that sentiment. Alena’s leggy physique goes well with her chic beauty. Her eyes are her weapons which could melt anyone’s heart. If she gets her catwalk and interview skills properly, she will be the runaway winner this year. Andrea Tovar of Colombia comes as close second in this list. After the disappointment last year, Andrea is poised to regain the glory for Colombia. Andrea is very classy and has earned a lot of positive remarks from worldwide pageant experts. If Colombia missed the crown last year by a hairline, this year, they are back with vengeance. In third place is Kristal Silva of Mexico. This lady has a rich experience when it comes to international pageantry which could help her a lot at Miss Universe 2016. Her beauty is undeniable and will definitely stand-out in the crowd. The third Miss Universe crown for Mexico is very possible this year! Peru may be perennially disappointed at Miss Universe but they should not lose hope. While it is true that year after year, Peruvian beauties are tagged as strong contenders but they always fall short, this year’s Miss Universe Peru is somehow different. Valeria Piazza displays a more toned down beauty that exudes more sweetness than fierceness. This is the key advantage of Valeria which could change the course of Peru. Rounding up the Top 5 is the understated beauty of Bojana Bojanic. Her beauty is quite divisive but she has her own charms. Of course, many of us missed the days when Serbia did well at Miss Universe. Bojana will revive the lost golden age of Serbia at Miss Universe and she could even pull a surprise! While Venezuela is in deep social and economic turmoil, let’s not underestimate its strength in the world of pageantry. Osmel Sousa is still on the help and he will do everything to ensure that Mariam Habach will fare well. That is why Mariam is currently on the sixth place. Indonesia has been flourishing well at the major international beauty pageants lately! When Kezia Roslin Warouw was crowned as Puteri Indonesia, the beauty-sphere was inundated with rave reviews about her. It is thus not a surprise that Missosology covered the pageant well because we have a strong feeling that the next Miss Universe might be from Indonesia! Miss Universe Philippines Maxine Medina will have a heavy baggage to carry this year. The current Miss Universe is from the Philippines and somehow that is a burden because a back-to-back win is pretty much improbable. Last year did show it could be possible so don’t discount her out. The Philippines is a beauty superpower and has mastered the art of preparing their candidates. Maxine could surprise us all! Miss Universe Panama Keity Drennan is on the 9th position in this list thanks to her sophisticated beauty and personality. She is expected to fare well in the interviews and the fact that Panama has already overhauled its beauty pageant organization makes this a favorable news to Keity’s chances at Miss Unverse 2016. Christina Mikkelsen of Denmark takes the final slot of the Top 10 as this drop dead gorgeous Danish beauty will makes waves this year. Denmark is reinvigorating its rather tepid pageantry scene and what could be fitting by sending the stunning Christina to Miss Universe. Catwalk is the Waterloo of Danish beauties but recent developments show that the organization is working hard to address the issue! Meanwhile, Miss USA Deshauna Barber may be on the 11th place in the Miss Universe 2016 1st Hot Picks but don’t let that fool you. Analysts are predicting that the political forces could point towards the victory of Deshauna. She’s intelligent, full of class and her beauty won the hearts of many. To put it bluntly, she could be the next Miss Universe! There has been a lot of talk about the way Ecuador selects its Miss Universe contestant but Connie Jiménez could surprise us the way Constanza Báez in 2013. It is important that keep an eye on Connie. Looking up north, Canada’s declining clout at Miss Universe may be turning a new page this year. Siera Bearchell may achieve something what no Canadian beauty had since 2009! Luck may have failed Canada but Siera, ranked 13th in the list, could get lucky this year. Barbara Filipovic of Croatia is currently ranked 14 and that’s because pageant experts were wowed by her sweet beauty despite the fact that Croatia’s pageant scene is not really flourishing like it used to. Which is a similar situation in Malaysia where the pageant organizations are struggling to government restrictions. This year could be the year when Malaysia will finally break its drought. A lot of hopes are placed on Miss Universe Malaysia Kiran Jassal. Will 2016 be finally the year when Malaysia be given the attention it deserves? And finally rounding up the Top 16 is Miss Myanmar Htet Htet Htun. Myanmar made a comeback in 2013 and it is yet to make a strong showing. Htet Htet Htun is by far the strongest Burmese beauty ever to compete at Miss Universe. Let’s hope Miss Universe will finally bestow that welcome gift from Myanmar a.k.a. Burma.